How are we going to cope with a 51% increase in people aged 65+ by 2030? How will we help and care for people with chronic disease? ( forecast to double in people over 65). How can we encourage and support healthy ageing? How can we reduce the blight of loneliness in our communities? How can we afford to pay for the increase in health & care provision? These are all critical questions that need to be addressed otherwise we are facing social meltdown and healthcare breakdown. The mental well-being of society is becoming an increasingly worrying issue facing us all. We don’t seem to have grasped the fact that urgent action and new thinking is required on mental health provision. 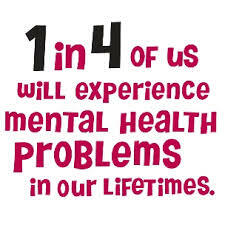 The cost of mental health to the NHS is £21 bn a year and £30 bn to employers (stress related absence). Local Authority funding will have fallen by £20bn (-43%) at the end of the austerity phase. So to Summarise – More people will experience mental health problems, the costs to the NHS and the economy is set to rise and severely stretched resources will reach breaking point very soon. Unless we start embracing new initiatives that improve the mental well-being of communities, we are facing a “social abyss” that will destroy the very fabric of society.